Bounce Rescue! PC-release speedrun race! Bounce Rescue! PC-release speedrun race! If you're interested, here's what you need to do. 1. Get Bounce Rescue from Steam Store. 2. Do a livestream on Twitch.tv. 4. 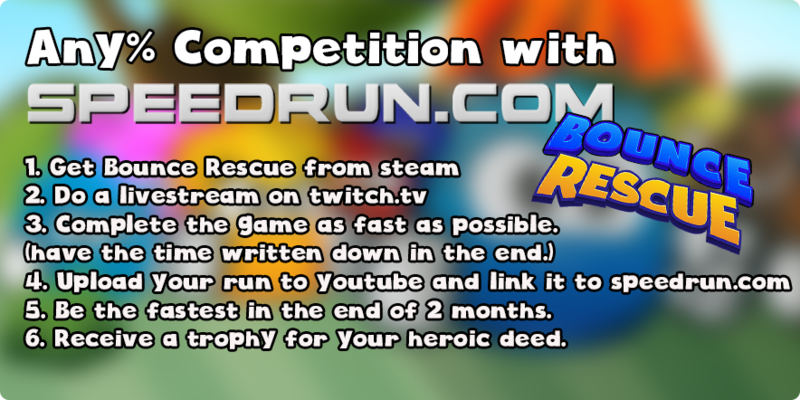 Upload your run to YouTube and link it to speedrun.com. 5. Be the fastest in the end of 2 months. 6. Receive a trophy for your heroic deed. We will then pm you (the fastest one) and give you a trophy for your heroic deed. Rules: No level skipping. Every level from 1-50 must be played through, you can use "glitches" or unintended game mechanics in the levels if you find some, but the character must begin from the start of the level and find their way to the end of the level. You can play the game through so you have all the levels open, but once you start the speedrun, no levels can be skipped. Also no TAS-stuff is allowed during the run. The timing starts at the beginning of the first level when you gain control of your character and ends in the last boss fight when you lose control of you character. Tips from the developer: Characters do vary, some characters are way faster than others, while others can jump higher.